Photo caption: “COME ALONG AS A GOOD FELLA’.” Joo Bang Lee demonstrates a simple technique for crowd control. A few fingers can control the movements of a large person. Lee has trained special forces in Korea to be able to control rioters with minimum force. Automobiles can be driven over his body without hurting him. Blocks of concrete can be smashed across his chest. He can jump 12 feet in the air from a standing position to deliver a flying spin kick. 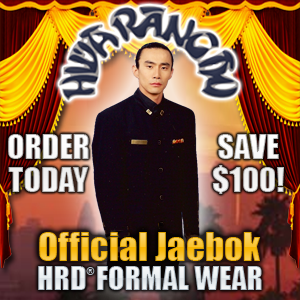 He is Joo Bang Lee, hwarangdo Founder, and president of the World Hwa Rang Do® Association. 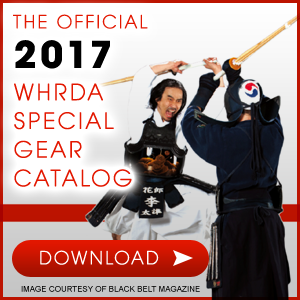 Lee has spent over 35 years of his life learning the more than 4,000 techniques of hwarangdo and the esoteric Buddhist philosophy, which influences their teaching. Lee’s brother is Joo Sang Lee, chairman of the World Hwa Rang Do Association. Together, they control the 56 hwarangdo schools in Korea and the 38 schools in the United States and Europe. Like his brother, Joo Sang Lee entered the Yang Mi Am Buddhist temple when he was a child and studied with Buddhist priest Suahm Dosa until the Lee brothers founded art name and opened the first hwarangdo school in Seoul, Korea, in 1960. It was the first time in modern history that hwarangdo was taught outside a Buddhist monastery. Joo Sang Lee was the first to come to the United States, making the trek in 1968. 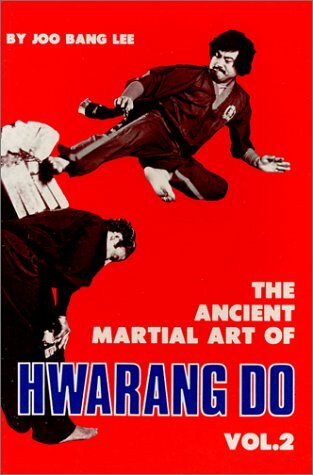 In 1972, Hwa Rang Do Founder Joo Bang Lee came to the United States. 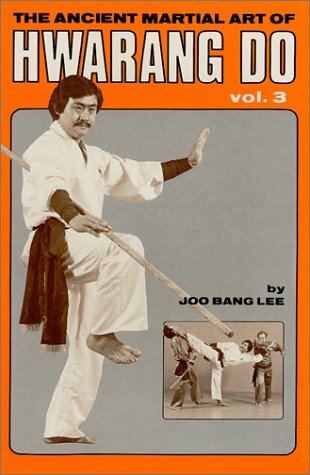 The brothers, particularly Joo Bang Lee, are best known for their version of ki, the ability to use “internal energy” to make their bodies hard, lighter, heavier or to feel no pain. They are specialized in this area and it is what sets their hwarangdo style apart. For example, in an experiment performed by the Biofeedback Research Institute, and reported in the December 1972 issue of Probe The Unknown magazine, Joo Bang inserted a spoke through the fleshy part on his arm, and lifted a 25 pound bucket filled with water. The bucket was suspended from the spoke, Joo Bang Lee felt no pain. What happens is difficult to describe in words, as the above conversation patches show. 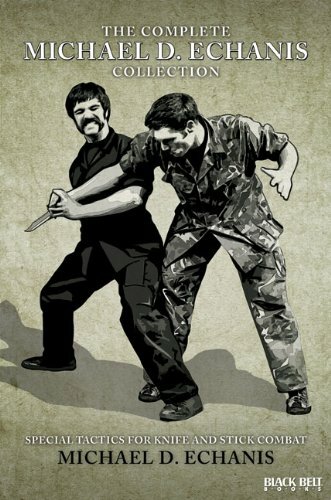 The fundamental aspect of the Lee brothers’ internal energy, however, is similar to some other martial arts. The fundamental concept behind the ki is that a power resides at the bottom of the abdomen, about three inches below the navel. Everyone is said to possess this power and to be able to learn to manipulate it. 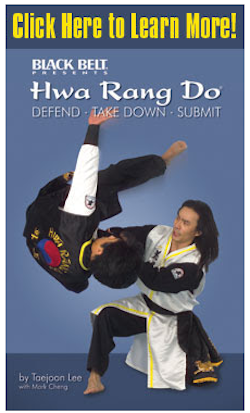 In hwarangdo, the Lee brothers explain, there are five aspects to the ki power. “Mental concentration and awareness; To make body hard like steel, is another way,” says Joo Sang Lee. “Can also make body lighter to jump higher. We also make body heavier. And last way is to make body feel no pain.” How does this operate in something like the spoke experiment? The best description is that Joo Bang Lee first moves the ki energy into the arm and then uses it to create some kind of activity in which whatever it is that causes feeling is “short-circuited” by the internal energy. During the penetration of the spoke, Lee says, he is fully aware of everything that is occurring. He simply feels no pain. In some fashion, he is able to ‘take feeling out” or take that part of his body and “separate it from the place where it would hurt” and place it elsewhere. Biofeedback researchers, commenting on the experiment they performed on Lee in the PROBE magazine article, said, “It is as if there is no room in the consciousness for the sensation of pain. It is active elimination. It is different from the passive willing of alpha elimination and biofeedback training. It seems to be ‘making it happen,’ as opposed to letting it happen,’ as in the case of classic meditation. It is superb concentration in an active sense. Zen masters and yogis, on the other hand, employ what also seems to be superb concentration but in a passive sense.” Apparently, there is more than one way to achieve this control of internal energy. Whatever this internal energy is, hwarangdo ki experts of which there are only a few claim it is real. “You can’t see the energy that runs through your nerve, but it’s there,” says hwarangdo student Dan Wanner. “Ki is even more subtle.” What do you feel when you’re controlling this ki? “It feels hot in the danjun area. In the palm there will be a strange, tingly sensation,” Joo Bang Lee student continues. “You can control pain as well as the circulatory system. 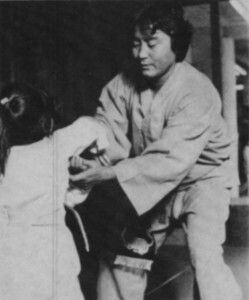 The masters can drive a nail through their hand without feeling pain or bleeding.” Joo Bang Lee ki control is particularly discussed among his instructors and students. One example concerns Bob Doggan, one of Joo Bang Lee’s student. The account, related many times, was told me by student Dan Wanner. “During a class, Duggan’s hands lost their circulation. No one knows why but he started getting numb. He checked Bob’s hands. Grandmaster Lee started to concentrate and his own hand turned blue. It was icy cold. He held Doggan’s hand and the circulation came back. Grandmaster Lee began to concentrate again and his hand eventually returned to normal.” If this happened as reported, the principle of a roving ki energy would also operate here. This ability is called Ki Ryuk Sool in Korean, or simply, moving the internal energy from or to different parts of the body. One descriptive analogy to explain this is that the ki practitioner concentrates on a very small area. In this case, the danjun or spot just below the navel. He concentrates on a small circle and expands that into larger ones and these radiate throughout the body. In the converse, a large, radiating circle is constricted into ever-smaller circles into that part of the body to which the energy is to be brought. Another, more showy experiment has Joo Bang Lee being placed, sitting in the lotus position, on a bed of nails, spaced one inch apart. Then an assistant comes in front of Joo Bang Lee and smashes bricks over his head. Joo Bang Lee remains completely unaffected. He can also, according to his associates, walk on and jump on broken glass without being cut. Some less esoteric, but still impressive, Lee brothers experiments are those surrounding breaking. The supreme test of breakage is to avoid using a leverage point. In supported breaking, the ends of a board remain stationary, usually held by an assistant. The board bends and eventually breaks at the point of impact, using the supported ends as leverage. Less force is required to cause breakage. The same would hold for any other breaking activity. Joo Sang Lee says the real test of breakage is to do it unsupported. He will suspend a one inch board by having each end hung in rice paper. The paper is so brittle that the weight of the board will almost tear it. Lee then steps forward, raises his hand behind his head, and kiaps. The descending hand makes impact with the board, which splits in two and falls to the floor, without tearing the paper. But what about the typical student who comes into a hwarangdo school? Will he or she come out as the personification of power? Not likely, at all, says student Dan Wanner. Like other schools, the dropout rate is very large, so few people ever make black belt. “I would say that one out of a hundred students gets to black belt rank,” Wanner said. But even at this state of proficiency, most of the learning is involved with physical techniques. 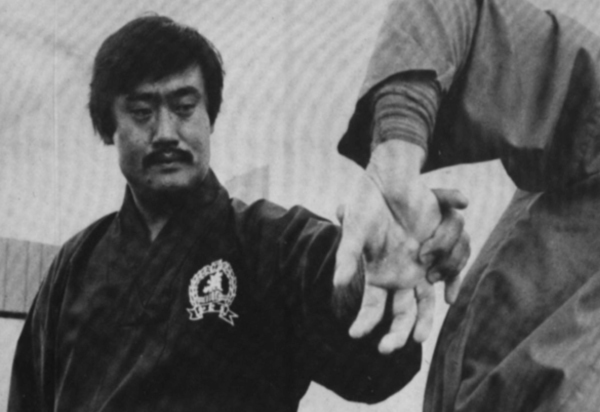 The mental aspect, which involves great emphasis on ki development, does not occur until the higher black belt degrees. What this means is that very few people really come to have a grasp of the ki. 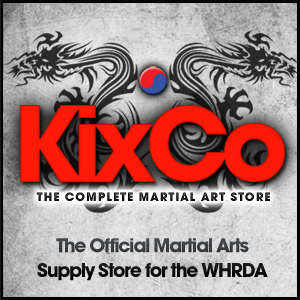 For most hwarangdo students, as for most martial arts students, the concept of the ki remains just that, a concept. But there is physical training to prepare the mind and body for ki training. 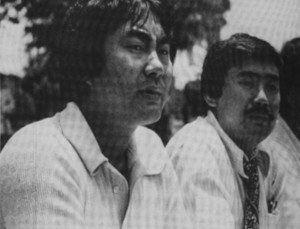 The Lee brothers utilize the ki-RyukSool, a phrase hard to translate. It is an exercise meant to develop control over the ki, and includes a type yell the beginning students must do over and over again. 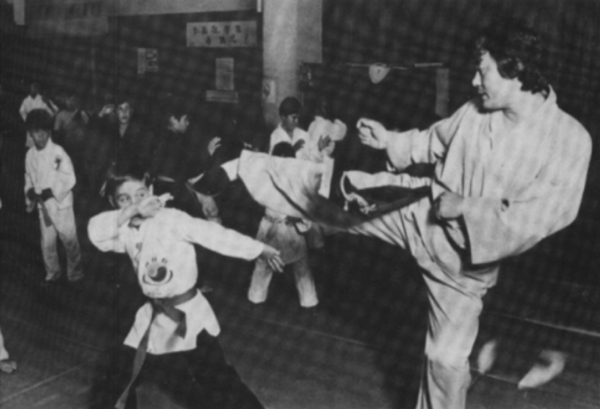 Instruction in punching and kicking is also geared toward control of the ki. Students are taught to remain relaxed during the delivery of a punch. Only at the point of impact is flexing to occur. At the same time, power is to be brought from the foot, along the leg and body and through the arm and fist to the point of impact. 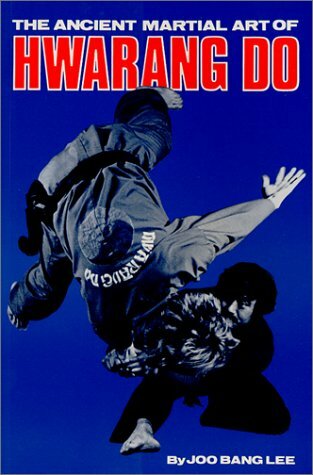 There is consistent work on preparing the body physically for a potential study of hwarangdo ki. The Lee brothers, for example, utilize the KiRyukSool. Students are instructed to tighten up their stomach-abdomen area, the seat of danjun from whence the ki power is said to originate. Arms and fingers are also to be tightened. 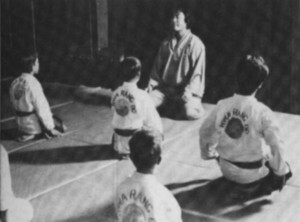 The student is taught to push out mentally from the stomach through the chest, arms and fingers reaching out to the space beyond his fingertips. At the same time, a breathing exercise involving a kiap type of release is done. “Students do this many times at the beginning and end of each class,” says Wanner. Another exercise done regularly is a lotus position meditation sequence. He studied meditation with Indian yoga mystics for four years prior to joining the hwarangdo World Headquarters and is very enthusiastic about the exercise. The exercise in its simplest form involves inhaling and exhaling of breath. The student is taught to think only about his breath. “His thinking must be focused on his breath, watching it mentally. He is not to think of anything else,” says Dan. Students do this during every class for about five minutes. This exercise is also designed to create a physical awareness, preparing the student for a more sophisticated grasp of the ki power. A casual stroller, coming into a Lee brothers hwarangdo school, might not see anything that is different from other martial arts schools. 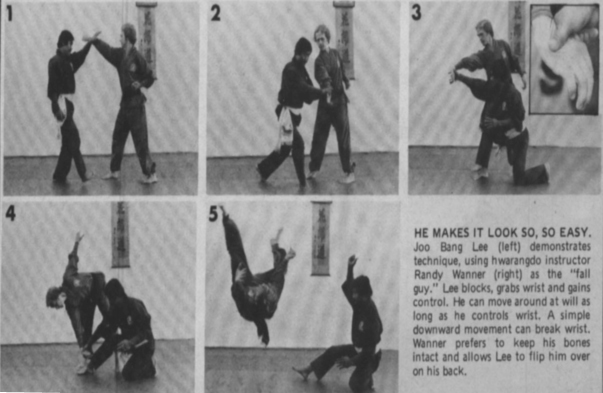 He would see the typical kicking and punching exercises. Students, in general, would be a little different. But a few would one day become the hwarangdo elite, able to tap para-physical powers about which most humans remain basically unaware.